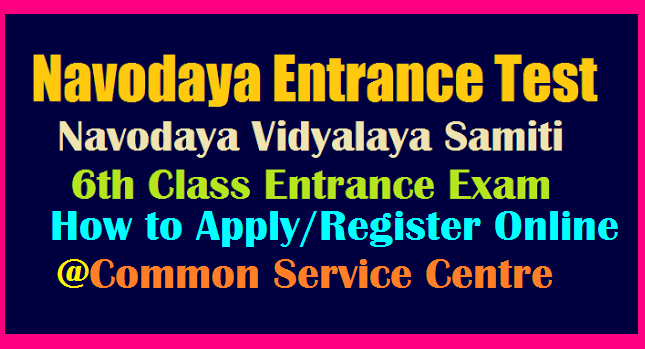 Navodaya Entrance Test 2018 How to Apply/Register Online @Common Service Centre Required Certificates: JNVST 2018 Online Registration Process | Navodaya Vidyalaya Samithi introduced Online System to Apply for Navodaya Vidyalaya Samithi 6th Class Entrance Exam 2018 onwards | Inntended students have to Register Online to attempt Navodaya Entrance Test 2018 | While Applying Online Students have have to Produce a Certificate from Headmaster of concern School where the student studying for the last 3years. Students have to visit Common Service Centre to Register/ Apply Online to upload Online Application Form. The application for JNV Selection Test 2018 is being processed through Common Service Centre of Ministry of IT, Govt. of India.